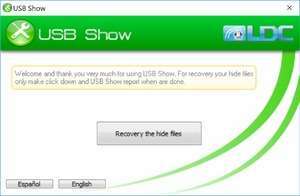 USB Show is a small specialty tool which can display the hidden files residing on external hard drives, USB thumb drives and other USB mass storage devices connected to your PC. Once you've click on the relevant button in USB Show and choose the drive you wish to work with, the program will sweep the entire drive for hidden files. After you've scanned the drive and opened it in Windows Explorer, you will be able to see all of the previously hidden files. It should be noted that not all files found with this application should be deleted so be careful if you're one a cleanup mission. For security reasons, you should also check out the USB Show download at LO4D.com which includes virus and malware tests. Additional screenshots of this application download may be available, too.